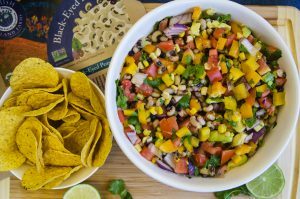 Try this easy crazy corn and black-eyed pea dip for your next get together! Chop up tomatoes, onion, bell pepper, avocado and cilantro. Heat the black-eyed peas and crazy corn in the microwave or on a stovetop to at least 160ºF.